Here are the items Tim Oake posted on his Blog in November 2009. The current home page of the Blog can be found here. Ingenious use of Flash, without being flashy. The American Institute of Graphic Arts (AIGA) is an association for communication design professionals. While we don't have design as an in-house skill - as you may have noticed from our site! - our work obviously involves regular collaboration with designers. It's always been a source of fascination and inspiration for me personally, and for some time I've enjoyed writing all kinds of material in English for the Dutch Design Awards, Lava Grafisch Ontwerpers, Design Academy Eindhoven, Studio Boot and others. I'm recommending a visit to a site today for the designers among you or for those who share my collegial admiration for the craft. The AIGA's Design Archives site is an interactive record of their annual juried selections of design excellence and the work of designers they've honoured. 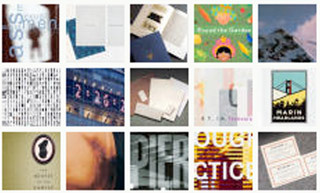 The AIGA archives represent an extensive collection of contemporary design for research and reference. It's been an expanding resource on American design, as each year's new selections and special collections are added. The latest annual selection, '(2009) 365: AIGA Year in Design 30', is a fascinating collection of design solutions divided over seven categories, from brand and identity systems design through information design to book design. As you might expect, the archive site is itself an example of outstanding design, elegantly drawing the visitor through the various design categories. As you navigate deeper, the site allows you to view increasingly detailed descriptions of each of the entries and the designers behind them. A beautiful example of how Flash can be used to great effect, and without being 'flashy' or using illegibly small font sizes. Heartily recommended. Our projects often require us to interview company executives and others for material to be used in all kinds of client publications  from corporate magazines through website articles and white papers to Annual Reports. I hope those of you who also need to record and transcribe will find the experience I describe here with some recording, processing and transcribing solutions useful. I started out in the '90s using a Sony professional cassette recorder, but by around 2003 we'd switched to mini-disk recorders. They made it much easier to rewind, fast forward and mark interview recordings when transcribing, but still required going backwards and forwards between the recorder controls and the computer keyboard. The ultimate solution we wanted was a digital recording option that would allow us to control the playback of interviews hands-free on our Macs while transcribing them into a Word document. At the end of 2006 we found the recording part of the solution we still use: Xtreme Macs MicroMemo (above), in combination with the the latest iPod at that time  the generation 5.5' video iPod. They both still work fine together, but unfortunately Xtreme Mac discontinued the MicroMemo last year. A number of other options are still available however, including Belkin's 'TuneTalk' and upmarket 'GoStudio', and the very upmarket 'ProTrack' from Alesis. The 'Lloyd microphone adapter' from Incipio has good reviews, but can only be used with the iPod Nano 4G. At the moment, we would go for the 'Mikey' from Blue. This seems to be as good as or better than our MicroMemo, and is compatible with the iPod 5G, Classic (as below), and Nano 2G, 3G and 4G models. So that's the recording part sorted - now on to processing and transcribing. Occasionally when using the iPod with a recording accessory, we've found that the volume levels can be too low, especially when the mic is more than 50 cm away from the interviewee or speaker phone. When this happens, however, weve found that the recordings are of high enough quality that we could use the free Audacity audio editing utility to bring them up to a suitable level without too much noise. Using the high quality mode requires roughly 10.3 MB per minute, so a 45-minute interview takes up about 460 MB, but that doesnt pose a space problem with an 80 GB iPod, and our interviews can easily be archived on external hard disks or optical media. Another advantage of the higher capacity iPods has been that they operate longer before they need recharging. Given that the MicroMemo can only be used on battery power, this is particularly important. What we needed to make our new interview and transcription system complete were two further items. The first was easy. Express Scribe transcription playback software can be downloaded for free from the good people at NCH Swift Sound in Australia. This great little application not only plays the recordings, but also allows you to vary the speed while maintaining pitch  very handy if youre not a speed typist and your interviewees a motor mouth. Based on our use of Express Scribe, we can certainly also thoroughly recommend their dictation recorder applications. You can use system wide 'hot' keys to allow you to control playback while typing in Word, but that requires programming keys to pause, rewind and fast-forward that wont affect Word or do anything else. It also requires other typing actions that divert your concentration from completing the transcription quickly and accurately. Hence the final item on our shopping list  some foot pedals to control Express Scribe and leave our hands free. While grateful to NCH for producing the software we needed and at no charge, we thought that ordering the USB foot pedals we wanted from Canberra would be a bit silly, and we also didnt want to wait the 10-25 days they estimated for them to get to Amsterdam. But after hours of googling, we still couldnt find a European reseller. Believe it or not, we eventually ordered them from a firm in Hawaii called Executive Communication Systems. At the equivalent of €47, their price was the lowest we'd found by far, and although the shipping and clearance cost the same again, they got it to Amsterdam within four days. Whoever the European distributors are, theyre keeping a really low profile, but in the meantime I can recommend the extremely efficient, friendly and helpful service of ECS in Honolulu. Now were enjoying much easier and faster transcription, so weve got exactly what we wanted, but if anyone can tell me where to buy these pedals in Europe, Ill pass on the information here. I have to admit that I tend to fall into the trap of being somewhat Amsterdam-centric when it comes to checking out possibilities for taking in a bit of culture. No surprise then that it took a trip I made yesterday to a prospective client headquartered in the Rotterdam area for me to learn for the first time that an outstanding exhibition had opened at the end of September at Rotterdams excellent Kunsthal. Modern Life: Edward Hopper and his Time is a touring exhibition of works from the Whitney Museum of Modern Art in New York. Prior to the Kunsthal it had spent the summer at the Bucerius Kunst Forum in Hamburg. In this case held as part of the celebration of 400 years New York (1609 - 2009), it features eight of Hoppers own works, together with  depending on which press release you read  no less than seventy or ninety pieces from his contemporaries. Although he was relatively successful in his lifetime, it is only since his death in 1967 that Edward Hopper has been considered by many to be the pre-eminent painter of 20th century America. Ive included images of the two paintings above  Seven A.M. from 1948 (top) and South Carolina Morning from 1955  as I understand they are amongst the eight Hoppers in the exhibition. Hes better known, however, for his subjects depicting the loneliness of big city life, and I guess one or two of these are also on view. Perhaps just as interesting will be the other great works from the Whitney in the exhibition  it makes me wonder whats still on show there while all these are away. They include two of my favourite modern American painters, Charles Sheeler (whose 1932 painting River Rouge Plant is shown above) and Georgia OKeeffe, together with Robert Henri (with whom Hopper studied), John Sloan, Stuart Davis, Man Ray, Lyonel Feininger and Grant Wood. Some sculpture and photographs (including some by Alfred Stieglitz) are also featured. Modern Life can be seen at the Kunsthal until January 17, 2010.